If you were a member of the Super Nintendo generation, there are probably at least a handful of names that are synonymous with greatness from that era. Mario, Final Fantasy, Metroid, and Zelda. The Legend of Zelda: A Link to the Past is truly a benchmark of how action/adventure games developed going forward in that era, and since its initial release, has been remastered on the Gameboy Advance, then pushed via Virtual Console on countless platforms. This new sequel from Nintendo is making an attempt to join its SNES counterpart in greatness. 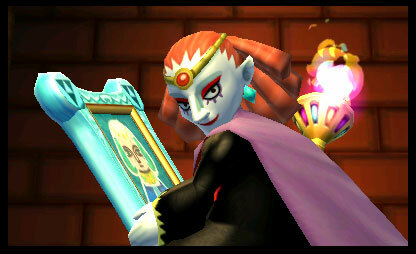 Yuga is your primary foe through Link’s latest Hyrule Adventure. A Link Between Worlds (ABW) moves at an almost frenetic pace compared to other Zelda titles. You’ll start with enough story exposition to point you in the right direction, and suddenly you’re off to save Hyrule. If you’ve never played a Zelda game, ABW is kind of a digested format of the same story and formula we’ve seen for decades. Princess in peril, kingdom doomed, Link is the hero powered by Triforce to save everyone from great evil. You’re not hampered by tutorials or repetitious dialog prompts, which is a big difference from Skyward Sword, as example. But the game mechanics keep up the same pace as the story – Link can swing his sword equally as fast as you can press the button, his movement speed is snappy and the enemies move at equally quick speeds. 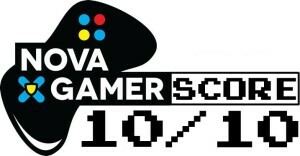 This is a smooth ride overall and the 3DS keeps up with the pace of the game without issue. 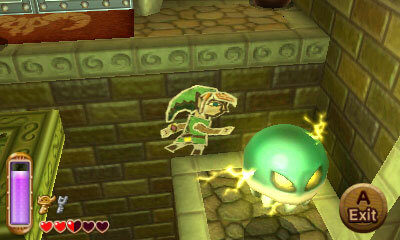 For those who remember the Hyrule of Link to the Past, this Hyrule is one in the same. From the layout of the overworld to the music, this is a familiar yet fresh take on the same universe we delved into over 20 years ago. There is a fine line between covering nostalgia and openly pandering to the crowd of Zelda faithful; I think Nintendo has done a good job of rebuilding a world that I loved in 1991, and now again in 2013. The sprites are all rendered in 3D this time, but the trees look the same, the buildings in Kakario Village are the same, Lost Woods is just as mysterious and Sahasrahla is there to talk to Link at the beginning of his quest. There is almost an overflow of familiarity of the game, but when you encounter a dungeon with new mechanics and bosses it is an exciting adventure into unknown areas. The good news is, in a world filled with nostalgia, there is certainly new things to talk about. 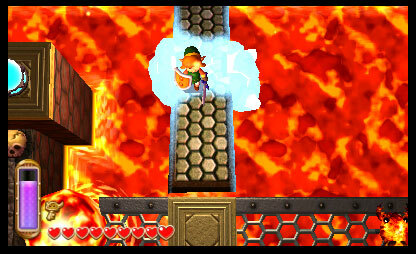 Link is given an ability to merge into walls and move about in a 2D plane, making him able to sneak into rooms or through obstacles that would have otherwise been in the way. There are some very intuitive puzzles based on this mechanic and a few that had me stumped before moving on. The dunegons tend to use height/depth frequently, so having the 3D functionality on the 3DS is a benefit. The last few dungeons specifically have lots of vertical movement, and I impressed with how the title handled the visuals. ABW departs from the usual Zelda progression line of “Get dungeon-specific item, complete dungeon” and lets you explore in a more open world design. You can rent or buy the majority of the items in the game, from the boomerang to the fire rod. If you die, the item merchant’s pet retrieves rented items from your body before you respawn. With so much money and available resources, the rental system works better than expected and I spent a few dungeons without all the weapons. A side note, you’ll get a summary screen at the end of the game that says how much total money you found as well as your total number of deaths. I wish it showed how much rental money you gave the item merchant! The dungeon design is clever and there doesn’t seem to be a single dungeon that goes on for too long. There are lots of hidden areas and side quests in the world to find as expected, plenty of weapon upgrades and mini games to be played. This is a packed world even from the start – if you choose to fall off the path of the main story thread. As I tore through the quest line of the story, I soon realized in the later third of the game that I needed to take some time to explore the world and see what I could find. I’m glad I did, because there are some fun encounters and items you can miss if you just keep on the story path. ABW controls well, the C-Stick gives full movement, the D-Pad moves the camera in any direction for a better view. Shoulder buttons are for shield and the running boots, and the face buttons are mapped to action, sword and items. You can fast switch between items using the touch screen, though I felt more comfortable using the “Items” subscreen to pause action to help formulate a plan in some cases. In a year of great 3DS offerings, this is another fantastic release by Nintendo, reminding us why many of us look at their games and consoles fondly. A Link Between Worlds is a well crafted dungeon crawl with plenty of character and enough story threading to keep everything held together at the quicker pace it moves at. © Copyright 2012. All Rights Reserved.